Luminex Corp., an Austin-based biotech company that develops diagnostic technology to identify diseases, is seeing its MAGPIX® technology used by scientists in the U.S. Army Medical Research Institute of Infectious Diseases in Africa to identify strains of the deadly Ebola virus that has killed nearly 800 people in recent weeks. Government scientists have been using the MAGPIX system since at least the late 2000s to develop assays that are used to test for the presence of viral proteins as well as antibodies directed at these antigens. Results of the assays provide information about replication of the virus and the immune response of the host. After training the field workers on how to maintain the MAGPIX equipment after the platform was purchased, Luminex has continued to remotely advise Army and medical personnel on how to address technical and repair issues in the field. Amy Altman, vice president of biodefense at Luminex, said the company is also four years into work funded by the National Institutes of Health to generate antibodies that can be used to detect different variants of the disease, which can help in studying its patterns of virality. Chad. “Luminex Helping Fight Ebola Outbreak.” http://www.bizjournals.com/austin/. Austin Business Journal, 5 Aug. 2014. Web. <http://www.bizjournals.com/austin/blog/techflash/2014/08/luminex-helping-fight-ebola-outbreak.html>. In the fall of 2010, a massive Cholera epidemic broke out in Haiti in the aftermath of the devastating earthquake that struck in early 2010. Luminex officials realized we could help. After getting in touch with GHESKIO (Haitian Group for the Study of Kaposi’s Sarcoma and Opportunistic Infections, a non governmental organization), our Director of Scientific Affairs, Dr. Sherry Dunbar and Jim Griffin, Senior Director, Global Technical Operations, along with two of our MAGPIX multiplexing systems and our xTAG® GPP (Gastrointestinal Pathogen Panel) were sent to the GHESKIO Institute in Haiti. Sherry and Jim made a total of four trips to Haiti to train technologists and engineers at the GHESKIO lab on performing the test, interpreting the results and troubleshooting the equipment. 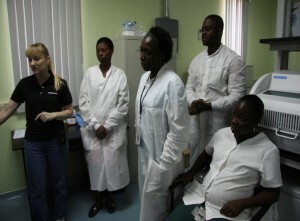 The introduction of MAGPIX and GPP assists in speeding the diagnosis and stemming the spread of cholera in Haiti. They also worked with Haiti’s national laboratory, the Laboratoire National de Santé Publique (LNSP), who used GPP to study the epidemiology of gastrointestinal infections in Haiti.